The Governors of the Haarlem Guild of St Luke in 1675. 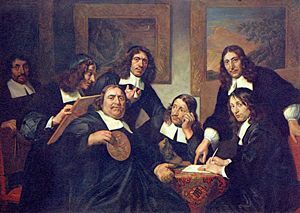 Jan de Bray painted himself second from the left. A guild is an association of craftspeople in a particular trade. The earliest guilds may have been formed in India circa 3800 B.C.E., and certainly existed in Roman times. They particularly flourished in Medieval Europe, where they were an essential and stabilizing economic influence. Guilds started as small associations of skilled artisans, experienced and confirmed experts in their field of handicraft. Over time they developed into larger, formal associations accepted by the governments of their countries. They had strict membership requirements, setting standards of quality and pricing, and maintaining a structured training system of apprenticeship that enabled young craftsmen to inherit the skills of the older masters. The medieval merchant and craft guilds provided a strong foundation for government and a stable economy, supporting charitable organizations, schools, and churches. They provided economic and social support for the transition from feudalism to capitalism. Finally they became outdated with the Industrial Revolution and the rise of capitalist corporations and trade unions, although guilds still exist in some sectors today, often by another name. The guild is an association of artisans or merchants, formed for the furtherance of their professional interests. Merchant guilds were generally composed of the merchants from a particularly community, usually a town, and included both the local retailers and long-distance traders and wholesalers. Craft guilds, by contrast, were limited to the craftspeople from a particular industry. Thus, there were guilds for metalsmiths, bakers, leatherworkers, weavers, and so forth. Arising from the association of families who had developed a particular craft, the craftspeople in a local area would get together to agree on the basic rules of their craft—quality, price, and so forth—and to regulate competition. Thus, they and their town prospered. The structures of the craftsmen's associations tended everywhere in similar directions: a governing body, assisting functionaries and the members' assembly. The governing body consisted of the leader and deputies. Each country had a different name for its leadership, but they all had the same duties. Those accepted into the guild were hailed as master craftsmen. Before a new employee could rise to the level of mastery, he had to go through a schooling period during which he was first called an apprentice. After this period he could rise to the level of journeyman. Apprentices would typically not learn more than the most basic techniques until they were trusted by their peers to keep the guild's or company's secrets. Like "journey," the distance that could be traveled in a day, the title "journeyman" derives from the French words for "day" (jour and journée) from which came the Middle English word journei. Journeymen were generally paid by the day and were thus day laborers. After being employed by a master for several years, and after producing a qualifying piece of work, the apprentice was granted the rank of journeyman and was given documents (letters or certificates from his master and/or the guild itself) which certified him as a journeyman and entitled him to travel to other towns and countries to learn the art from other masters. These journeys could span large parts of Europe and were an unofficial way of communicating new methods and techniques. After this journey and several years of experience, a journeyman could be received as master craftsman. This would require the approval of all masters of a guild, a donation of money and other goods, and in many practical handicrafts the production of a so-called masterpiece, which would illustrate the abilities of the aspiring master craftsman. The medieval guild was offered letters patent (usually from the king) and held a monopoly on its trade in the town in which it operated: handicraft workers were forbidden by law to run any business if they were not members of a guild, and only masters were allowed to be members of a guild. Before these privileges were legislated, these groups of handicraft workers were simply called 'handicraft associations'. The town authorities were represented in the guild meetings and thus had a means of controlling the handicraft activities. This was important since towns often depended on a good reputation for export of a narrow range of products, on which not only the guild's, but the town's, reputation depended. Controls on the association of physical locations to well-known exported products, such as wine from the Champagne and Bordeaux regions of France, tin-glazed earthenwares from certain cities in Holland, or lace from Chantilly, helped to establish a town's place in global commerce—this led to modern trademarks. In pre-industrial cities, craftsmen tended to form associations based on their trades. Usually the founders were free independent master craftsmen. The earliest craftsmen's organizations are purported to have been formed in India during the Vedic-period from 2000 - 500 B.C.E. Greek organizations in Ptolemaic Egypt were called koinon. The Chinese hanghui probably existed already during the Han Dynasty (206 B.C.E. - 220 C.E. ), but certainly they were present in the Sui Dynasty (589 - 618 C.E.). Starting from their third century B.C.E. origins the Roman collegia spread with the extension of the Empire. Roman craftsmen's organizations continued to develop in Italy of the Middle Ages under the name ars. In Germany they are first mentioned in the tenth century, called Zunft (plural Zünfte). Métiers in France and craft gilds in England emerged in the twelfth century. Craft organizations (senf, sinf) stemmed from the tenth century in Iran, and were seen to spread also in Arabia and Turkish regions under the name futuwwah or fütüvvet. In Benin, 900 of the carvers are said to have founded their own organization. In the neighboring tribes of Yoruba and Nupe the organizations were given the names egbe and efakó. Islamic civilization evidenced the notion of guilds for the artisan—most notably to the warraqeen, or "those who work with paper." Early Muslims were heavily engaged in translating and absorbing all ilm ("knowledge") from all other known civilizations as far east as China. Critically analyzing, accepting, rejecting, improving and codifying knowledge from other cultures became a key activity, and a knowledge industry as presently understood began to evolve. By the beginning of the ninth century, paper had become the standard medium of written communication, and most warraqeen were engaged in paper-making, book-selling, and taking the dictation of authors, to whom they were obliged to pay royalties on works, and who had final discretion on the contents. The standard means of presentation of a new work was its public dictation in a mosque or madrassah in front of many scholars and students, and a high degree of professional respect was required to ensure that other warraqeen did not simply make and sell copies, or that authors did not lose faith in the warraqeen or this system of publication. Thus the organization of the warraqeen was in effect an early guild. Local guilds also served to safeguard artisans from the appropriation of their skills: The publication industry that spanned the Muslim empire, from the first works under the warraqeen system in 874 and up to the fifteenth century, produced tens of thousands of books per year. A culture of instructional capital flourished, with groups of respected artisans spreading their work to other artisans elsewhere, who could in turn copy it and perhaps "pass it off" as the original, thereby exploiting the social capital built up at great expense by the originators of techniques. Artisans began to take various measures to protect their proprietary interests, and restrict access to techniques, materials, and markets. In the Early Middle Ages most of the Roman craft organizations, originally formed as religious confraternities, had disappeared, with the apparent exceptions of stonecutters and perhaps glassmakers. Gregory of Tours tells a miraculous tale of a builder whose art and techniques suddenly left him, but were restored by an apparition of the Virgin Mary in a dream. Michel Rouche has remarked that the story speaks for the importance of practically transmitted journeymanship. The early egalitarian communities called "guilds" (for the gold deposited in their common funds) were denounced by Catholic clergy for their "conjurations"—the binding oaths sworn among artisans to support one another in adversity and back one another in feuds or in business ventures. The occasion for the drunken banquets at which these oaths were made was December 26, the pagan feast of Yule. Bishop Hincmar, in 858, sought vainly to Christianize them. Like their Muslim predecessors, European guilds imposed long standardized periods of apprenticeship, and made it difficult for those lacking the capital to set up for themselves or without the approval of their peers to gain access to materials or knowledge, or to sell into certain markets, an area that equally dominated the guilds' concerns. These are defining characteristics of mercantilism in economics, which dominated most European thinking about political economy until the rise of classical economics. By about 1100 European guilds (or gilds) and livery companies began their medieval evolution into an approximate equivalent to modern-day business organizations such as institutes or consortiums. The guilds were termed corps de métiers in France, where the more familiar term corporations did not appear until the Le Chapelier Law of 1791 that abolished them, according to Fernand Braudel. The guild system reached a mature state in Germany circa 1300 and remained in the German cities into the nineteenth century. The latest guilds to develop in Western Europe were the gremios of Hispania that signalled the progress of the Reconquista: Barcelona (1301), Valencia (1332), and Toledo (1426). Not all city economies were controlled by guilds; some cities were "free." Where guilds were in control they shaped labor, production and trade; they had strong controls over instructional capital, and the modern concepts of a lifetime progression of apprentice to craftsman, journeyer, and eventually to widely-recognized master and grandmaster began to emerge. As production became more specialized, trade guilds were divided and subdivided, eliciting squabbles over jurisdiction that produced the paperwork by which economic historians trace their development: there were 101 trades in Paris by 1260), and earlier in the century the metalworking guilds of Nuremberg were already divided among dozens of independent trades, in the boom economy of the thirteenth century. In Ghent as in Florence the woolen textile industry developed as a congeries of specialized guilds. The appearance of the European guilds was tied to the emergent money economy, and to urbanization. Before this time it was not possible to run a money-driven organization, as commodity money was the normal way of doing business. 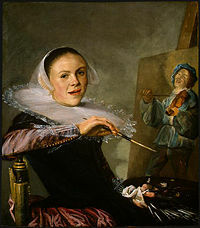 Judith Leyster self-portrait at 20, three years before she became the first woman to join the Haarlem Guild in 1633. Beside their economic and training functions, guilds served social and charitable purposes. Often association with a patron saint, they might maintain a chapel in their local parish church, as well as a guildhall for official events and business. The Guild of Saint Luke was the most common name for a city guild for painters and other artists in early modern Europe, especially in the Low Countries. They were named in honor of the Evangelist Luke, the patron saint of artists, who was identified by John of Damascus as having painted the Virgin's portrait. The guild of Saint Luke not only represented painters, sculptors, and other visual artists, but also—especially in the seventeenth century—dealers, amateurs, and even art lovers (the so-called liefhebbers). In the medieval period most members in most places were probably manuscript illuminators, where these were in the same guild as painters on wood and cloth - in many cities they were joined with the scribes or "scriveners." In traditional guild structures, house-painters and decorators were often in the same guild. However, as artists formed under their own specific guild of St. Luke, particularly in the Netherlands, distinctions were increasingly made. Guilds also made judgments on disputes between artists and other artists or their clients. In such ways, it controlled the economic career of an artist working in a specific city, while in different cities they were wholly independent and often competitive against each other. The guilds were identified with organizations enjoying certain privileges (letters patent), usually issued by the king or state and overseen by local town business authorities (some kind of chamber of commerce). These were the predecessors of the modern patent and trademark system. The guilds also maintained funds in order to support infirm or elderly members, as well as widows and orphans of guild members, funeral benefits, and a 'tramping' allowance for those needing to travel to find work. As the guild system of the City of London decayed during the seventeenth century, the Livery Companies devolved into mutual assistance fraternities along such lines. In many German towns, the more powerful guilds attempted to influence or even control town authorities. In the fourteenth century, this led to numerous bloody uprisings, during which the guilds dissolved town councils and detained patricians in an attempt to increase their influence. The guild was at the center of European handicraft organization into the sixteenth century. In France, a resurgence of the guilds in the second half of the seventeenth century is symptomatic of the monarchy's concerns to impose unity, control production, and reap the benefits of transparent structure in the shape of more efficient taxation. The guild system survived the emergence of early capitalists, which began to divide guild members into "haves" and dependent "have-nots." The civil struggles that characterized the fourteenth century towns and cities were struggles in part between the greater guilds and the lesser artisanal guilds, which depended on piecework. "In Florence, they were openly distinguished: the Arti maggiori and the Arti minori—already there was a popolo grasso and a popolo magro". Fiercer struggles were those between essentially conservative guilds and the merchant class, which increasingly came to control the means of production and the capital that could be ventured in expansive schemes, often under the rules of guilds of their own. German social historians traced the Zunftrevolution, the urban revolution of guild members against a controlling urban patriciate, which perhaps were foretastes of the class struggles of the nineteenth century. In the countryside, where guild rules did not operate, there was freedom for the entrepreneur with capital to organize cottage industry, a network of cottagers who spun and wove from their own premises on his account, provided with their raw materials, perhaps even their looms, by the capitalist who reaped the profits. Such a dispersed system could not so easily be controlled where there was a vigorous local market for the raw materials: wool was easily available in sheep-rearing regions, whereas silk was not. 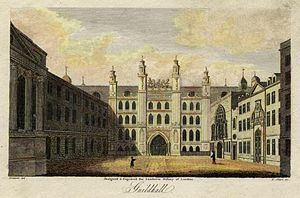 Despite its advantages for agricultural and artisan producers, the guild became a target of criticism towards the end of the 1700s and the beginning of the 1800s. They were believed to oppose free trade and hinder technological innovation, technology transfer and business development. Two of the most outspoken critics of the guild system were Jean-Jacques Rousseau and Adam Smith, and all over Europe a tendency to oppose government control over trades in favor of laissez-faire free market systems was growing rapidly and making its way into the political and legal system. Karl Marx in his Communist Manifesto also criticized the guild system for its rigid gradation of social rank and the relation of oppressor/oppressed entailed by this system. In part due to their own inability to control unruly corporate behavior, the tide turned against the guilds. Because of industrialization and modernization of the trade and industry, and the rise of powerful nation-states that could directly issue patent and copyright protections — often revealing the trade secrets — the guilds' power faded. After the French Revolution the guild system was disbanded and replaced by free trade laws in most European nations. By that time, many former handicraft workers had been forced to seek employment in the emerging manufacturing industries, using not closely-guarded techniques but standardized methods controlled by corporations. Despite the problems that had emerged with guilds, particularly their exclusivity and monopolistic practices which hampered the adoption of technological and entrepreneurial innovation, the downfall of guilds was not uniformly a public good. Marxism detailed the problems resulting from the alienation of the worker from the products of work that this created, and the exploitation possible since materials and hours of work were closely controlled by the owners of the new, large scale means of production. Modern guilds exist in different forms around the world. In many European countries guilds have had a revival as local organizations for craftsmen, primarily in traditional skills. They may function as for developing competence and are often the local units of a national employer’s organization. 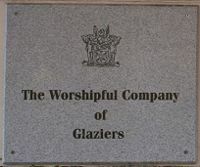 The Worshipful Company of Glaziers and Painters of Glass is one of the Livery Companies of the City of London. In the City of London, the ancient guilds survive as Livery Companies. There are 107 Livery Companies based, almost all of which are known as the "Worshipful Company of" the relevant trade or profession. Some Livery Companies (for example, the Scriveners) continue to have a regulatory role today. Most Livery Companies, particularly those formed in recent years, are charitable foundations. The active Livery Companies also play an important part in social life and networking in the City of London. In Australia there exists the Guild of Commercial Filmmakers, a collection of commercial, short film, and feature filmmakers. In the United States guilds exist in several fields. The Screen Actors Guild and Writers Guild of America are capable of exercising very strong control in Hollywood because a very strong and rigid system of intellectual property respect exists (as with some medieval trades). These guilds exclude other actors and writers who do not abide by the strict rules for competing within the film and television industry in America. Quilting guilds are also very common and are found in almost all areas of the United States. Associations which can be classified as guilds, though it may not be evident in their names, include the American Medical Association. Many professional organizations in fact resemble the guild structure. Professions such as architecture, engineering, and land surveying require varying lengths of apprenticeships before one can be granted a professional certification. These certifications hold great legal weight and are required in most states as a prerequisite to doing business there. Real estate brokerage is an excellent example of a modern American guild. Signs of guild behavior are on display in real estate brokerage: standard pricing (six percent of the home price), strong affiliation among all practitioners, self-regulation (by the National Association of Realtors), strong cultural identity, little price variation with quality differences, and traditional methods in use by all practitioners. In September 2005, the U.S. Department of Justice filed an antitrust lawsuit against the National Association of Realtors challenging practices that, it asserted, prevent competition from practitioners who use different methods. The practice of law in the United States is also an example of modern guilds at work. Every state maintains its own Bar Association, supervised by that state's highest court. The court decides the criteria for being admitted to, and remaining a member of, the legal profession. In most states, every attorney must be a member of that state's Bar in order to practice law. State laws forbid any person from engaging in the unauthorized practice of law and practicing attorneys are subject to rules of professional conduct that are enforced by the state's high court. The free software community has from time to time explored a guild-like structure to unite against competition from the monopoly of Microsoft. For example, a list of what constitutes free software is published by Debian, and Advogato assigns journeyer and master ranks to those committing to work only or mostly on free software. In online computer games players form groups called "player guilds" who perform some of the functions of ancient guilds. They organize group activities, regulate member behavior, exclude non-conforming individuals, and react as a group when member safety or some aspect of guild life is threatened. In games where fictional "building" is possible they may cooperate on projects in their online world. This practice was taken from the guilds in the quasi-medieval settings of the role-playing game Dungeons & Dragons. Guilds are sometimes said to be the precursors of modern trade unions, and also, paradoxically, of some aspects of the modern corporation. Guilds, however, were groups of self-employed skilled craftsmen with ownership and control over the materials and tools they needed to produce their goods. Guilds were, in other words, small business associations and thus had very little in common with trade unions. The merchant guilds, however, can be considered forerunners of the Chamber of Commerce. The exclusive privilege of a guild to produce certain goods or provide certain services was similar in spirit and character with the original patent systems that surfaced in England in 1624. These systems played a role in ending the guilds' dominance, as trade secret methods were superseded by modern firms directly revealing their techniques, and counting on the state to enforce their legal monopoly. Modern antitrust law could be said to be derived in some ways from the original statutes by which the guilds were abolished in Europe. Some guild traditions still remain in a few handicrafts, in Europe especially among shoemakers and barbers. 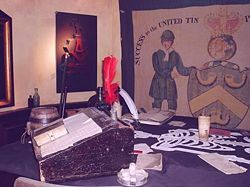 Some of the ritual traditions of the guilds were conserved in order organizations such as the Freemasons. These are, however, not very important economically except as reminders of the responsibilities of some trades toward the public. Thomas Malone of the Massachusetts Institute of Technology champions a modern variant of the guild structure for modern "e-lancers," professionals who do mostly telework for multiple employers. Insurance including any professional liability, intellectual capital protections, an ethical code perhaps enforced by peer pressure and software, and other benefits of a strong association of producers of knowledge, benefit from economies of scale, and may prevent cut-throat competition that leads to inferior services undercutting prices. And, as with historical guilds, resist foreign competition. ↑ Antitrust Case Filings. United States v. National Association of Realtors. U.S. Dept. of Justice. Antitrust Division. Retrieved July 16, 2007. ↑ Staff Writer. 2007. Guild History. Guild Unlimited. Retrieved July 6, 2007. Black, Antony. 1984. Guilds and Civil Society in European Political Thought from the Twelfth Century to the Present. Cornell University Press. ISBN 978-0801416903. Deguilhem, Randi, and Suraiya Faroqhi, Eds. Crafts and Craftsmen of the Middle East: Fashioning the Individual in the Muslim Mediterranean, (Islamic Mediterranean Series) I. B. Tauris, 2005. ISBN 1860647006. Eggerer, Elmar W. 1993. Sworn Brethren and Sistren—Britische Gilden und Zünfte von der normannischen Eroberung bis 1603. München. Richardson, Gary. 2005. Medieval Guilds EH.Net Encyclopedia, edited by Robert Whaples. Retrieved July 17, 2007. Rouche, Michel, and Paul Veyne. 1987. Private life conquers state and society. (A History of Private Life.) Harvard University Press. ISBN 0674399749. Söderlund, Ernst. 1949. Den Svenska Arbetarklassens Historia—Hantverkarna II Frihetstiden Och Den Gustavianska Tiden. Stockholm. Thomas Weyrauch, Thomas. 1996. Handwerkerorganisationen in der vorindustriellen Stadt. Laufersweiler. Wettenberg/Germany. ISBN 3930954028.
van Wieringen, Fons, and Graham Attwell, Eds. Vocational Education in Europe. Norwell, MA: Kluwer Academic Publishers, 1999. Weyrauch, Thomas. 1999. Craftsmen and their Associations in Asia, Africa and Europe. Laufersweiler. Wettenberg/Germany. This page was last modified on 22 January 2014, at 16:20.